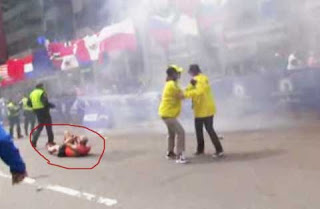 The 78-year-old Boston runner was near the marathon finish line when he was knocked down by a very large bomb blast. He was actually caught on video that was uploaded on Youtube by The Boston Globe. As you can see from above images the 78-year-old Boston runner named Bill Iffrig, of Lake Stevens, lying in the marathon road. He said to The Herald of Everett, "It was only 5 feet away from me," he added, "It was really loud." The old man was so scared from the Boston Marathon explosions experience, he told that the incident was a close one. According to his son Mark Iffrig, "he was tracking his father's race progress online and didn't realize what had happened until he went on Facebook to post about his dad finishing the race. He quickly turned on the TV and called his dad," he told to The Associated Press. If you like to watch the actual bombing in the Boston Marathon, just click here. For the meantime, If you like this information, please bookmark it now or visit this site more often for you to be updated. You may also share this post to your friends so they may know about 78-year-old Boston runner. Comments or suggestions about "78-year-old Boston runner survive the bomb blast" is important to us, you may share it by using the comment box below.